Starting batteries usually have higher cranking amps, but lower reserve time ratings. Deep cycle, or dual purpose batteries, can also have high cranking power, but they have higher reserve capacity as well. The construction of a deep cycle battery allows more discharge/ recharge capability. This is helpful for running electronics, a trolling motor, etc. Automotive batteries are usually lighter construction and lower reserve time. Heavier construction, e.g. thicker plates, makes marine batteries stronger. This allows them to better tolerate the conditions they are exposed to in marine use. It is a common misconception that automotive batteries, engine parts, etc. are interchangeable with marine parts. This is NOT true. There are many differences in construction, especially when related to anything involving electrical, fuel, or the dampness inherent to boating. Safety is always an important factor, and stronger tolerance to the abuse of marine situations is also an issue. Standard use and recharging with a battery charger when the battery discharges, causes little harm to a battery's life. But allowing your battery to fully discharge, either by letting it sit idle for a long period of time or through heavy use without recharging, will severely shorten the battery's life. Repeatedly cycling a battery (discharging and charging in midrange, never being charged to 100% of its capacity) is also a factor in premature battery failure. Partially or fully discharged batteries can damage alternators. An alternator is designed to maintain a battery, not to charge it. Many battery chargers, either portable or on-board chargers, are designed to operate when needed, turning off or switching to a "trickle charge" mode. A common misconception with marine batteries is cranking amps. "Cold Cranking Amps" (CCA) is a reference for 0o cranking power, while "Marine Cranking Amps" (MCA) is a reference for 32o cranking power. While CCA can be an issue with automotive battery power, you're not likely to be using your marine battery at 0° (at least we hope not). MCA is the cranking power you should look at when buying a marine battery. A battery loses its ability to be fully recharged by building Crystalline Sulfate, which can't be broken down by normal charging, so it reduces the battery's capacity. If enough build-up occurs, the battery can't be charged. When you try to charge the battery, the regulator will sense a false reading that indicates the battery is fully charged. Although gel-cell batteries require less maintenance than wet-cell batteries, they are more expensive. Wet-cell batteries perform better and are less expensive, and can last for a long time if you give them the proper care. 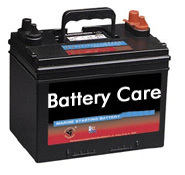 Wet-cell battery life can be improved by topping off with distilled water if the electrolyte level drops too low. Ideally, it should be ½" above the plates of the battery. Although this is an unnecessary step with a gel-cell battery, you'll pay more for it, and get weaker performance. Storing a marine battery properly for the winter is also a factor in battery damage. If the battery is not at a full state of charge, it can freeze. But heat causes a battery to discharge faster. A cool, dry area is the best place to store a battery, such as a shelf in a garage or basement, as long as dampness is not an issue. Batteries should be charged about once a month overnight (12 hours) at about 2 amps to maintain them over the winter.